Konzept einer hochseetüchtigen 12 m Fahrtenproa mit vier Kojen. Neues Video von Russ Brown über Jzzero und eine kleine Powerproa. Gedanken zum Deltasegel anhand von 3D-Grafiken aus Freeship. Proa KALAPUNA mit drei Personen gut unterwegs. Baltic Proa Conference 2011 You are more then welcome to Baltic Proa Conference 2011 for Central Europe if by any chance you could attend. You could see it on proafile, because the date has been just decided. 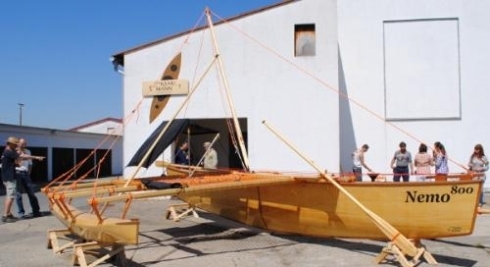 Event will take place on Jamno Lake on 1st weekend of July.After that, a fleet of volunteers will sail for a week along Baltic sea-shore golden beach. Jamno Lake (near Koszalin) is shallow water aquatorium where light designes can be tested and compared safely. Lake is connected with Baltic sea with narrow channel so lake trials can be extended easily for sea trials.We expect simple camping facilities to be available. For previous event in July 2010, 7 proas were announced and 6 actively participated. There was day of trials and then official parade in front of local authorities and media. A lot of talks, experience sharing, some crew swapping hot evening and following week 2 proas had left for the Baltic trip. Von seiner Proa, seinem Hawaiian Outrigger und seinem Doppelkanu hat Gunnar Jetzsch aus Mexiko einige Bilder geschickt.